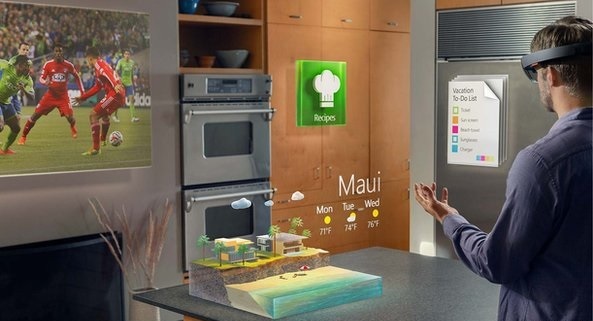 Microsoft has previewed the upcoming Windows alongside a new wearable 3D gadget called the HoloLens. The HoloLens lets wearers use their hands to interact with virtual objects, in what it touted as the next generation of computing. A Microsoft engineer showed how the goggles could be used to view and edit 3D renderings of people, machines or other objects. "Until now, we've immersed ourselves in the world of technology," Microsoft's Alex Kipman said, at a media event at the firm's Washington state headquarters. "But, what if we could take technology and immerse it in our world?" It is unclear when the gadget, which is wireless and runs on Windows 10, might be available for sale. The company said that the final version of the machine would not need to be linked to other devices to work, and should be released within Windows 10's "timeframe". It revealed NASA was already working with the kit, and said the US space agency hoped to start controlling its Mars rovers with a prototype version as soon as July. Microsoft also revealed that Windows 10 will be free for those running the current version of Windows. The new operating system will be available for those on its Insiders preview programme from next week, and a version for phones will be coming next month. The software has reintroduced the famous Start menu, which was removed from Windows 8. It also features a new notifications bar as well as the Continuum feature, which allows users to switch seamlessly between tablet and PC mode. Cortana, Microsoft's digital assistant and Siri rival, will be available on desktop computers for the first time. Cortana can be used to ask questions as well as look up information on the web, via voice command. Meanwhile, Microsoft's signature productivity apps - Office, comprising Word, Excel and PowerPoint - will be built into Windows 10 on phones. Greater capability will also be offered for users reading PDFs and other reading material, which can be stored offline and made accessible to users' mobile devices. Ahead of the launch, there were rumours about whether or not Microsoft would introduce a new web browser. "We think it's the right time to build a new browser for the modern web," Microsoft's Joe Belfiore said. "I'm excited to introduce you to ... codename Project Spartan." Belfiore highlighted three key features of the Spartan browser. The first is note-taking mode, which lets users write and draw on the page with a stylus. They can then share it complete with added notes to social media and email. The second feature is reading-based - an option where users could change the appearance of a webpage so that it looked like a book. There is also a reading list which allows users to save articles and pages for later. Microsoft said it would be "three, four, five months" before those on the preview programme able to start using Spartan. It was also revealed that the official Xbox app would now be built into every Windows 10 device and that gamers will be able to play across different platforms.